Lucy corrected me this past weekend when, in the midst of our first yoga session, I told her I wasn’t any good at yoga. “You’re not good at yoga yet,” she said. Then she folded over like a collapsing flip phone. I was not doing great. Finn was just saying that because he is naturally encouraging. I had wanted to try yoga for a while. Like everything else, getting started on new things like this tends to be the hardest part. Which is why I made the kids do it with me. “Way ahead of you,” I told him. I don’t actually want to do yoga. But this is the eternal, internal fight I have: What I know is good for me vs. whether or not I am actually willing to do it. I know that yoga is super healthy. I get muscle injuries from time to time, and I know yoga can probably help mitigate that. I know yoga will make me more flexible and can probably decrease any pain I may feel. I know it is good for the body as one gets older. Which, apparently, I am. Not to mention, everyone loves yoga. (Or rather, everyone who loves yoga loves yoga.) There are literally no downsides to yoga. So why am I not doing yoga? Probably for the same reason I’m not cutting down on gluten or creating a gratitude jar: I need a quicker return on my investment. This Beachbody Yoga program, for example, is a three-week program. Three weeks. You know how long that is?? A genie could come out of a bottle and tell me that if I cut out carbs for three weeks then ALL MY DREAMS WILL COME TRUE and I’d still have no chance. I’m not even sure I’d be able to wait for the oven to preheat before I ripped open the frozen parmesan-garlic bread with my teeth and pounded the entire icy loaf down my throat like a sword swallower, slapping the caboose with an open palm like somebody trying to get the last of the ketchup out of a glass bottle. I have very little chance of success when I don’t see immediate results. I don’t do well with willpower, or accountability partners, or apps that encourage you by making pinging noises when they give you a badge that, frankly, you can’t really use. Here is where I HAVE found success: My wife. I have said this before in this blog: I have an audience of One. And that One is a wonderful encourager. Liz told me, maybe three years ago, that it made her feel loved when I cooked dinner for her. I am the opposite of a foodie. If I could take a daily food pill I would do it. But when Liz told me that, I started cooking that very evening. My early results were not great. If I was alone, I would have quit. But Liz was touched by the fact that I had tried. And ever since then, I have done the cooking in the house. And still, every night, without fail, she tells me how much she loved the meal I made (even if it wasn’t that great) and how it made her feel cherished by her husband. She does that because she knows me really well and because she knows that I thrive on encouragement from her. She tells me over and over that she loves my writing, so I keep on writing. She tells me that I make her laugh, so I try to be funny every ten to fifteen seconds. She tells me she loves it when I make her coffee in the morning, so I’ve made her coffee every morning for years now. And every single time she acts as if I’ve just bought her a dozen long-stemmed roses. And here’s the kicker: Lizzie works an intense job as a lawyer for McKinsey & Co., the prestigious consulting firm. She organizes the kids’ lives, from activities to school to everything. She manages our home. She tracks and calculates our finances on a daily basis. And a million other things. Lizzie hasn’t asked me to do yoga. If she did I would have been doing it every morning and I would be typing this blog balanced on my tailbone with my legs wrapped around my waist like a belt. Still. Maybe I’ll give it another try. Take the pressure off Lizzie for needing to encourage me in everything in my life. Also, it’s supposed to be good for you and whatever. The Top Five Basic Yoga Moves I Learned in Session One…. LOVE child’s pose! I knocked child’s pose out of the park. It felt actually relaxing! 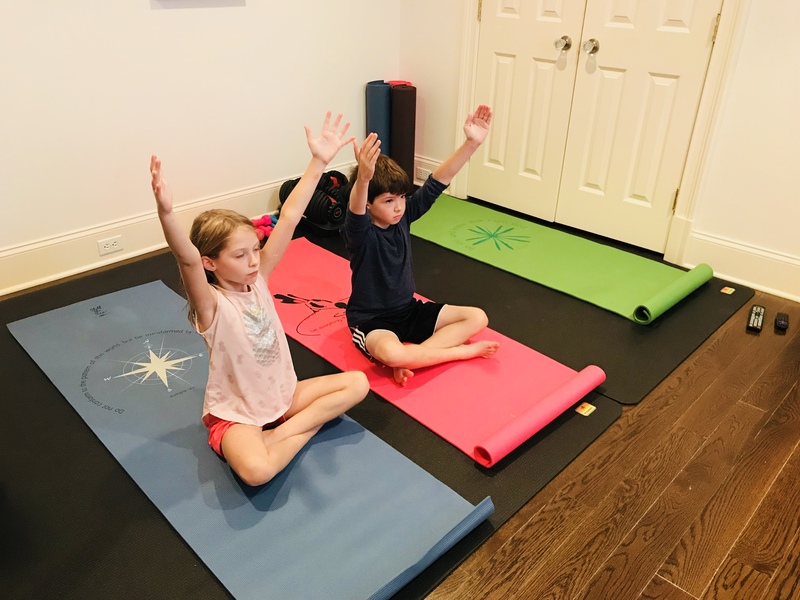 And Finn was like “You’re doing really well dad!” and Lucy, a different kind of encourager, peeked over and told me that it was actually supposed to be relaxing only gets harder from here and that child’s pose is called child’s pose for a reason but stick with it, dad. This is one of those poses where you balance on one leg and the helpful yoga instructor tells you “Find that balance, like a flamingo…” which is about as unhelpful as a comment can be. It’s like a swimming instructor throwing me off the back of a Carnival Cruise and shouting down at me to hold my breath like a sperm whale. I got off to a great start with this one, getting down on my mat. Then I had to fold a leg under me, pointing perpendicular to my body. Last time I saw that pose was on my He-Man action figure when I was whirling it around by the ankle. Warrior pose is actually pretty cool. If I could just master that pose I think I’d be doing yoga all the time. It’s sort of half-intimidating, half-graceful, half-Odell Beckham Jr. celebrating a first down. It’s also called Warrior Pose, which is the best. Alright. Back to sitting down and carpel tunnel syndrome. I’m looking it up today! Dog yoga wins every time. Thanks for reading, Marialaina! The first time I tried downward facing dog, my left arm inexplicably gave out from under me, I fell on my elbow and punched myself in the eye. The YMCA instructor reassured me “this happens all the time when people are new to alternating between relaxation and stress.” This left me with the choice of a lifetime of rigid stress or trying to relax without beating the hell out of myself. That’s such a glorious, glorious image. I would love to freeze it right at the moment of shock when you see your fist coming at your face. Amazing. And so relaxing. Good day! What a coincidence! 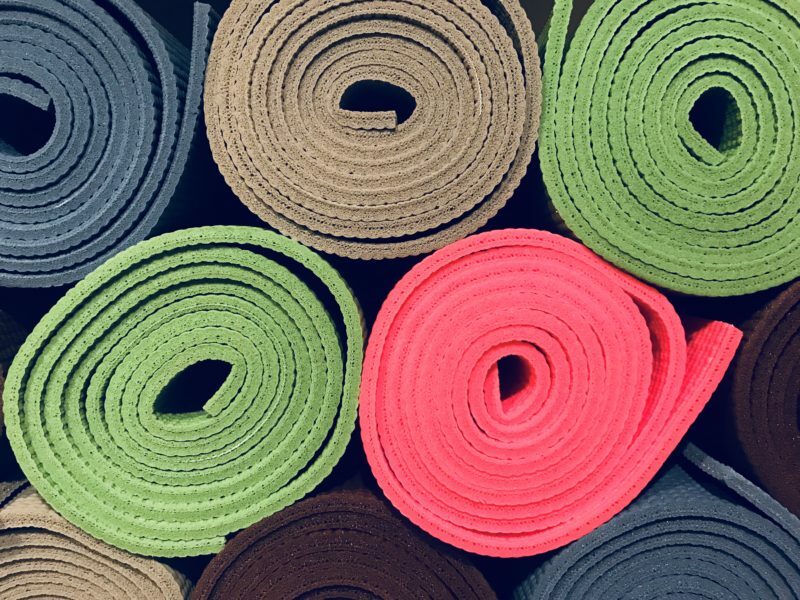 After decades of believing that I wouldn’t be able to “do” yoga, I took my first yoga class on Monday. It’s an adaptive yoga class for people with chronic pain, recommended by my doctor and disguised as a “Mindful Movement” class. I wanted to cry a couple times during the class – not out of frustration or pain or embarrassment, but because paying attention to my body made me realize how often I ignore my body’s needs, and that is sad. Anyway, good for you and keep it up! I suggest checking out “Cosmic Kids Adventures” on YouTube. 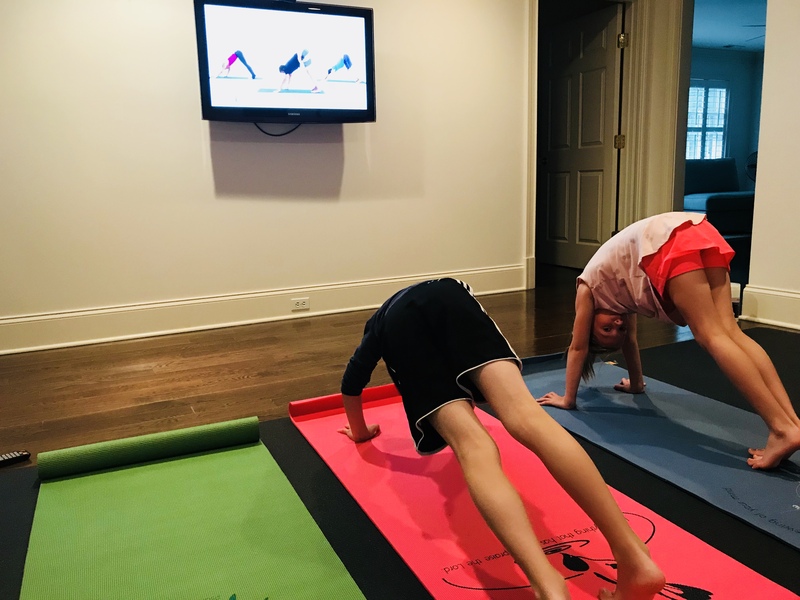 It’s yoga for kids – disguised as fun! Best wishes. It should literally be the only page in the husband handbook. Laughing and crying again., Love this. And you don’t need me to tell you this but you hit the lottery with Liz. Without all the stress and pingpong balls. Remember yoga is a practice. No comparing, no straining, no BS. You come to your mat just as you are, much like Jesus calls us to the cross. Btw, Inhale Grace will be open to men on Saturdays. Get there!!! So cool Jill!! LOVE Inhale Grace. Also I’m guessing Eric is already crashing that party…. Ooh. I love that. I’m down. I know your real audience of One is God, who loves you so much, and who gave you to me as His great gift to me in my lifetime. But I loooove this blog, and you, and every single morning coffee you make, and the way you love those zany kiddos of ours. And we’re going to rock yoga because we have to because we are old and sit at desks so much. Yoga = growing older with you in health, God willing! I’ve been ignoring the call to yoga for better health for awhile. Because I don’t want to. But I have now upgraded from “thinking about thinking about it” to just thinking about it, so, maybe soon-or not. Also sometimes in my city they advertise goat yoga, where you can go and do yoga in a room full of baby goats. That should be on someone’s bucket list somewhere. More importantly, I just messaged my husband and told him how much I appreciate the fact that he makes the coffee every morning, forever for our entire marriage. The coffee smell is my alarm clock and as far as I’m concerned because it magically appears when the sun rises. My husband creates that illusion and I was reminded today that maybe a thank-you is in order. So I did. Goat yoga will be the only yoga we do in the year 3000. And love that you messaged your husband!! So sweet!! Thanks for writing! Another great blog entry! Loved the line about yoga, gluten and gratitude jars – funny and (painfully) true! Hope you all are well. Shhhh….don’t tell anyone but I tried yoga and hate it. Don’t worry, I got your comment over FB :-). Great post – Never tried Yoga and after reading this, I’m glad I didn’t. However, a daily stretching does a body good. The wisdom and meaning you find in various, daily things in your life is great. I take it your love language is words of affirmation? Mine too – big time. 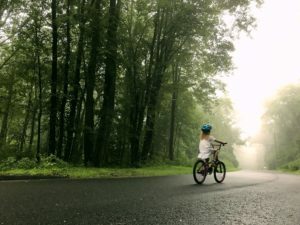 Another great blog post – excited for the next one. We do so many things because we “should,” when we really could be doing them because they’re fun! Or they feel good! I also have trouble with delayed gratification, and so I procrastinate forever. Even if it felt great yesterday! We’ve grown up with negative messages that were not doing things right, so we want to do everything perfectly or not at all, even the first time we try something. What we’re forgetting that we can accept ourselves as we are, that we are perfect just as we are, just the way God finds us and accepts us and loves us. Your blog is a light spot in my day and I appreciate that you share so much of yourself, your life, and your wonderful family with us. I remember when each of your children was born. And I, too, came to you via The Little Princes, which is still on my bookshelf. Thank you for so much. I love that, Pat! Thanks for sticking with us Grennans! I always get immediate results from yoga – as soon as I’m out of a particularly uncomfortable pose, I immediately feel better! Early on in my yoga journey (at my neighbors little studio where deer sometimes pass by the large windows) I was so relaxed one evening that I felt like Gumby, all rubbery and almost unable to drive. If a deer had been standing in the road going home I would not have been able to react, I was THAT relaxed. I always sleep better after yoga – keep it up, it will become like breathing to you and your minis. I promise. I’m afraid my best (and only) yoga pose would be the “Now I’m Stuck Like This”. They would have to tow me to the chiropractor, leg tucked under my armpit. From this blog I’ve taken that I need to encourage my husband more!!! Maybe then he will do some cooking?? I smell a support group coming on!